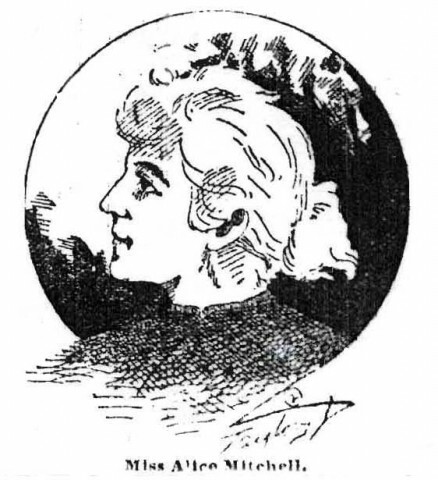 The above quote represents one of the most striking bits of Sonja Livingston‘s “Mad Love: The Ballad of Fred & Allie” creative nonfiction piece demonstrating how strictly defined and deeply inscribed gender roles were 100 years ago. No question they still are, but the fact that any deviation on this count was immediately and summarily recognized as insanity. It’s striking because it serves as a sobering reminder just how firmly our assumptions about what’s right, natural, and good are constantly corrected through a cultural lens. We’re still seeing this battle play out in terms of LGBT and gender equality—marking yet another moment in the battle for social justice for an underrepresented minority. 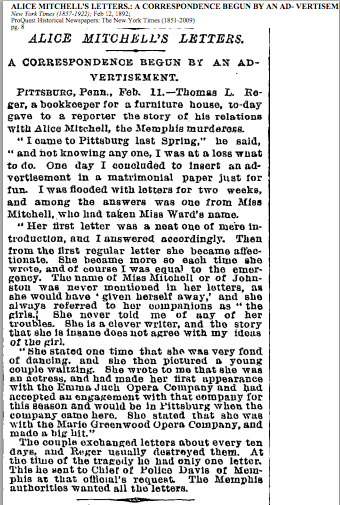 And that becomes that much more complicated when you take these cultural assumptions in 1892 and frame them within a shocking and grisly murder between illicit lovers? 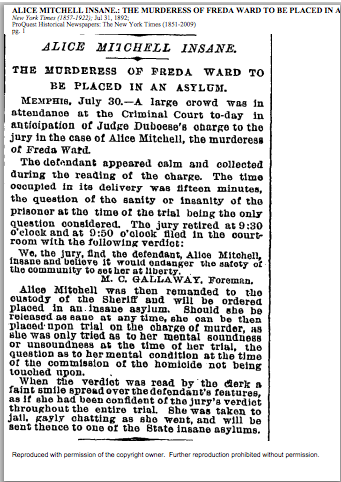 The brutal murder of Frederica Ward by Alice Mitchell in on the streets of Memphis, Tennessee in broad daylight amongst witnesses in January 1892 was just that. A shocking murder that became scandalous when Alice Mitchell openly admitted her intentions to assume the role of a man, marry Frederica, and live happily ever after as man and wife. Such a possibility was nothing short of madness, yet Livingston’s retelling of this tale more than 100 years later when this very issue is the most profound civil rights battle of our moment—it takes on a deeper sense of immediacy. This is a form of constructed insanity we’ve been trying to break free from for decades, and we’ve never been so close, just ask the thousands of gay, lesbian, and trans couples that have marriage unions recognized by various states around the U.S. So, the insanity of gender trouble becomes much ore about a culture’s evolving sense of tolerance (or intolerance depending how you want to understand this). She’s bound for Bolivar now. They would simply cut her down. With a wealthy family and good lawyers you could be crazy too, but could you be queer? So questions of class, insanity, and gender converge in a case that offers up some interesting ideas of how so many cultural factors work together to give us just one perspective of a mutlifaceted incident as any event, no less a crime wherein people’s fates can be decided. 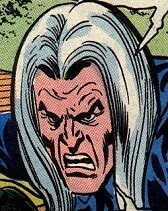 The idea of truth as a construct of one’s position within a culture becomes more and more difficult to ignore, if not escape altogther. 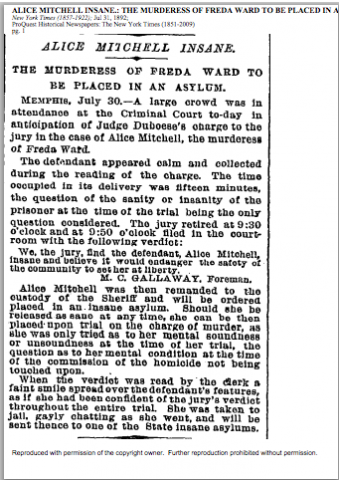 This entry was posted in True Crime and tagged Alice Mitchell, Frederica Ward, truecrime. Bookmark the permalink.